The library at the University of East Anglia has kindly found and sent me this announcement for A Series of Lectures to mark the 50th anniversary of the Russian Revolution. I attended these lectures in 1967 and have some observations now that another fifty years have passed. 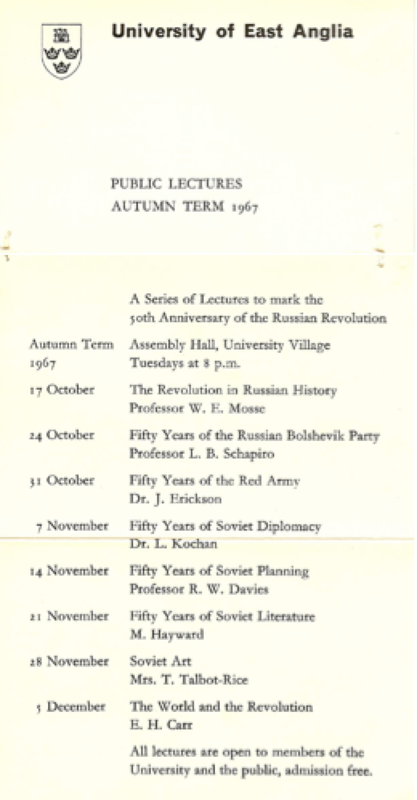 The phrase ‘fifty years ago’ will be the last words many want to read or hear, but in 1967 they were used at UEA with dramatic effect to introduce a lecture series to mark the fiftieth anniversary of the Russian Revolution. These lectures took place against a backdrop of the first stirrings of évènements in Paris, the intensification of conflict in Vietnam, the colonel’s coup in Greece, civil wars in Congo and Nigeria, and the six-day war between Israel and its Arab neighbours. Like 1917, 1967 was a year full of international uncertainty. The people who told the story of 1917 understood the effects of the revolution and vividly communicated the rush and chaos of historical events. These experts had experienced the turmoil that followed the Russian Revolution: economic meltdown, Nazi atrocities, the rise and the effects of both communism and anti-communism, war, deprivation, exile, imprisonment, loss of livelihood, homeland and family. E. H. Carr, whose 14-volume history of the Soviet Union demonstrates the breadth and depth of the knowledge that underpinned this lecture series, was not only a prominent scholar but also someone with extensive personal experience of the diplomatic comings and goings of the first half of the twentieth century. Leonard Shapiro worked as a barrister and in military intelligence before becoming one of the ‘fathers of Sovietology’. Others had family connections: Leo Tolstoy was Tamara Talbot-Rice’s godfather, and John Erickson had an uncle who was serving in the Russian navy during the storming of the Winter Palace in Saint Petersburg (called Leningrad in 1967). Werner Mosse and Lionel Kochan were key figures in exploring the story of Jews in Eastern and Central Europe, so intimately bound up with all European history, and they opposed those who sought to trivialize or politicise this history. Kochan attacked the ‘Holocaust industry’, believing that this was a matter too serious for popular comment. He also thought that it made little sense to study Jewish history without a knowledge of Hebrew. As we enter 2017 we are again in interesting times, and, while the Russian Revolution is now part of a mostly unremembered history, let’s hope that the events that will mark its centenary will sharpen our awareness of the unpredictability and volatility of human events, awaken the desire to understand history in order to shape the future, and avoid the sentimentality and kitsch that has so often tarnished recent commemorations of historical events. The leaflet for the 1967 lectures shows the full list of the eminent historians and their broad-ranging topics. The lectures were delivered with knowledge and understanding to an audience that included many callow young people who were then trying to interpret the political realities of their own troubled time. Fifty years ago the long-lasting effects of the 1917 revolution were clear and the lectures made connections across the decades. Now they are not so obvious. It’s worth considering that 2017 will be marked by equally key events, ones that will shape our world for the coming century. The role of the university and the public lecture in making connections between the past, present and future in the international sphere remains important, even when this may be unpalatable or embarrassing to the powers that be, both inside and outside the university.